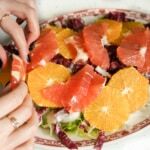 This endive and radicchio salad with oranges and grapefruit is a refreshing way to kick off spring. Start by prepping the citrus. Trim the orange at both ends and stand it up on a flat side. Run a sharp knife around the outside to remove all the peel and pith, turning the fruit as you go. Then slice the bare orange into 1/4-inch-think rounds and then into half-moons. Repeat with the grapefruit. Make the vinaigrette. In a medium bowl, combine the lemon juice, maple syrup, mustard, miso, salt, and pepper. Whisk to combine. While continually whisking, slowly stream in the oil. Assemble the salad. Scatter half of the endive, radicchio, lettuce, citrus, and almonds on a serving platter and drizzle with half of the vinaigrette. Top with a second layer of the vegetables and citrus, drizzle with the remaining vinaigrette, and top with the almonds. Serve immediately.